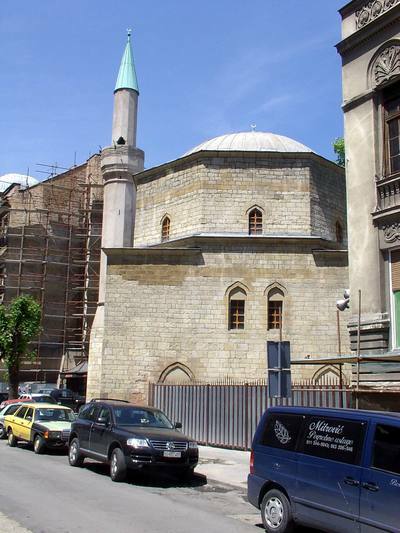 Bajrakli Mosque, 16th c. CE, Belgrade, Serbia – Photograph 2005 Via Wikimedia Commons. On November 11, Al Jazeera announced from its home offices in Doha, Qatar that it had broadcast its first "Al Jazeera Balkans" news bulletin at 5 p.m., Bosnian time. A press release described Al Jazeera's southeast European enterprise as "the first regional news channel," which, the report continued, "fills a large gap in the market. News till now has been country specific." Al Jazeera Balkans (AJB) is the second non-Arabic branch launched by the network, after Al Jazeera English, which started broadcasting in 2006. According to managing director Tarik Đođić, $20.5 million has been invested in AJB, headquartered in Sarajevo. The station's news director is Goran Milić, a well-known Croatian television journalist. In a press release, Milić explained that, "Getting this diverse mix of people together to produce this broad news product has been a long cherished dream, not just for me, but for the peoples of this region. This bridge-building could only happen under the banner of Al Jazeera, with its global commitment to news." In reality, the "dream" is anachronistic, since the former Yugoslavia maintained state media that sought to impose a "regional" identity on differing communities. Milić was involved in running Yutel, a network that attempted to rescue Yugoslavia during its collapse, from 1990 to 1992, and was also located in Sarajevo, where it was a casualty of the Bosnian war. Al Jazeera's proprietors may see the revival of a "Yugoslav" television network as a step forward, but it's no accident that the media of the states that made up the former Yugoslavia are "country specific." Media reflect the interests of each post-Yugoslav republic's residents, who tend to be indifferent or hostile to their cross-border neighbors' concerns. "Bridge-building" has become an eternal promise, and a permanent failure, in the former Yugoslavia. Al Jazeera Balkans will broadcast live only for six hours in the evening, from 6 p.m. to midnight. The rest of its "Balkan" program will be drawn from the output of Al Jazeera English. Al Jazeera Balkans will operate additional studios in Zagreb, Belgrade, and Skopje, the capitals of, respectively, Croatia, Serbia, and Macedonia. Locally generated broadcasts will be aired exclusively in the idiom formerly known as Serbo-Croatian, and now as Bosnian-Serbian-Croatian, or B-S-C. Its press release claims that Al Jazeera is now watchable in Slovenia, Croatia, Bosnia-Herzegovina, Montenegro, Kosova, and Macedonia. But Slovenes and Macedonians possess their own Slav languages, completely different from B-S-C, and Albanian, spoken by the overwhelming majority in Kosova, is not a Slav tongue. Sheikh Ahmed bin Jassim Al Thani, a member of the Qatari royal family and Al Jazeera director general, said, "We want Al Jazeera Balkans to truly be an open free platform for the people of the region to debate and have a free dialogue." Oddly, AJB will have no bureau in Kosova, or Albania, even though these are the two Balkan countries with the largest Muslim communities. Kosova is ninety percent Muslim and Albania is 70 percent, while Bosnia by comparison is roughly 50 percent Muslim. Al Jazeera's choice of Slavic-only broadcasting would doubtless alienate the public in the Albanian lands. Older Kosovar Albanians may understand Slavic speech, but would be unlikely to pay attention to broadcasts delivered in it, and very few people speak Slavic languages in Albania itself. Qatari Islam is officially Wahhabi, like that of Saudi Arabia, but without the extreme restrictions on women, and prohibitions on other forms of Islam and non-Muslim religious practice, that persist in the Saudi kingdom. Similarly, the leadership of Islam in Bosnia-Herzegovina, Serbia, Croatia, and Slovenia is conventional and friendly to Arab influence. By contrast, Islam in Kosova and Albania is heterodox, hostile to outside interference, and broadly influenced by the spiritual traditions of Sufism, which are abhorrent to Wahhabis. Finally, Kosova and Albania are well known for their pronounced sympathy with the U.S. In entering the Balkans, Al Jazeera has opted for an attempted revival of a long-shattered Yugoslav cultural unity, combined with a gambit for greater Islamist influence. Its decision comes at a bad time for the region, with Wahhabi radicals agitating across Balkan borders, and the neo-fundamentalist Turkish regime of Recep Tayyip Erdogan bidding for revived prestige in the former Ottoman provinces in Europe. It is doubtful that evocation of the long-gone, artificial nationality of the former Yugoslavia will make Al Jazeera's investment in the Balkans profitable. However, the corrupt politicians dominating the ex-Yugoslav successor states may find it lucrative to have connections to Gulf petrobillionaires.